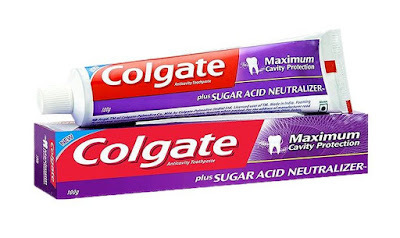 SUGAR ACID NEUTRALIZER ™ TECHNOLOGY It fights sugar acids in plaque, the No.1 cause of cavities. This technology is clinically proven. It has the combination of calcium and fluoride, which helps reduce cavities at an early stage by half. Watch how Colgate Maximum Cavity Protection plus Sugar Acid Neutralizer efficiently uses its Pro-Argin technology (arginine and calcium) to neutralize sugar acids in plaque. Combined with Fluoride, it helps repair the damage caused by sugar acids and give maximum cavity protection.